- Manufactured from high strength LLD. - Adjustable Cone Hurdle Set Consist of 10 No Cones, with adjustable heights from 2" to 8"
TCM-01-A: Set of 40 in 4 colors with Stand & Printed Box. TCM-01-B: Set of 50 in 5 colors with Stand & Printed Box. TCM-01-C: Set of 25 in 5 colors with Carry Strap. TCM-01-D: Set of 10 in 1 color Zip Tied. We are offering an extensive series of Saucer Cones. 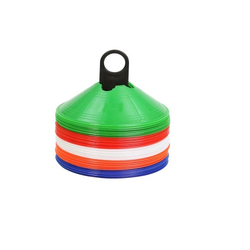 Being a leading enterprise of this industry, we are offering a huge range of Saucer Cones. - Made from soft and flexible vinyl. - Set of 50 cut top in 5 color consisting of 10 of each color. 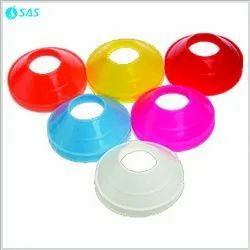 We are offering Saucer Cones with following features :- Made up of soft plastic.- Comes in set of 50 saucer cones in 5 colors.- Available in all bright color.- Comes with rust proof steel stand & in carry bag.- Carry strap to carry 50-100 saucer cone is also available.